Businesses in Farnham are excelling when it comes to providing a great customer experience, according to a recent independent mystery shopper review. 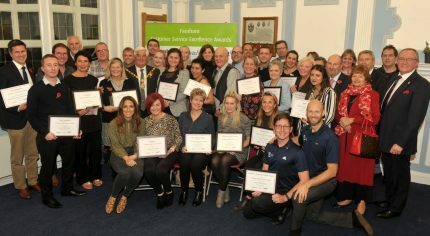 Over 50 people gathered at the Farnham customer service awards on 6 November at Farnham Town Council to celebrate their achievements, which were highlighted by the review. “While online shopping is clearly here to stay, the internet can never compete with the high street when it comes to an enjoyable and personal shopping experience. This review shows that businesses in Farnham are giving their customers great service and are looking to do even better,” says Lead Member for Tourism and Events Councillor Jill Hargreaves who presented some of the awards at the ceremony. Farnham Town Council and Waverley Borough Council funded the Farnham Customer Experience Review to give local businesses looking to up their game in customer service a boost with professional expertise. Supported by customer feedback specialists insight6, 60 independent retailers and businesses took part. Mystery shoppers visited each business, assessing various factors including interior layout, customer service and window displays. 101 Records, Bells Solicitors, Farnham Furnishers, Farnham Library and Nineteen were praised for their impeccable customer experience, scoring full marks of 100% in the mystery shopper assessment. A further 27 local businesses received gold awards for outstanding service and 19 received bronze and silver awards. Jim Smith of insight6 who carried out the assessments said: “These numbers are a real boost as the high street faces its share of challenges. Our research shows that Farnham has a high number of shops and businesses giving customers a great experience, a vital factor if they are to return. Repeated footfall is what all high streets crave so this is all good news for businesses dealing with competition from bigger players, the internet and the major redevelopment projects in the town centre. The range of interesting and eclectic businesses and these results make Farnham a great place to shop and spend time. In fact, collectively, these are the best results of any town in Surrey.